Oooooops! 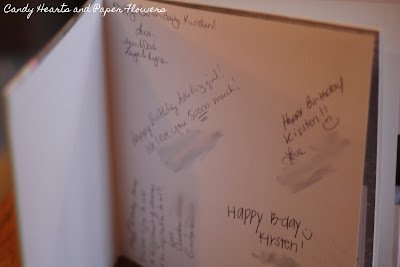 I mentioned in the post about Kirsten's first birthday party that I'd share the guestbook idea I used this year. I even took pictures of it, and somehow forgot to post about it. Susan reminded me yesterday, so here it is. 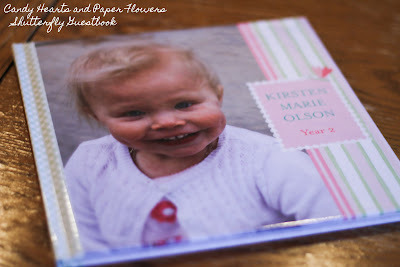 I created a book with Shutterfly using the pictures from this past from her first birthday until about 2 weeks before her 2nd birthday. I had guests sign the liner pages and will be doing this every year. By the time she is 18 she'll have a great little collection of books full of pictures and things to remember about each year complete with greetings and well wishes from the people who love her. Wow Barbara! I love this idea. I am a digital scrapbooker and hadn't thought of using the blank pages in the book to record messages/notes/memories. I am working on digital annual albums of our family. How fun it would be to have everyone write standout memories for the last the year in the book once it is completed. I have a LOT of fun throwing together books in Shutterfly now that they have their custom path books. Complete control! Muahahahaha! I never take the time otherwise. I made a book for hubby as a sort of story of things they do together last year, and so thought it would be a good idea to do one for this year, just more of her whole year, not just her and her dad. Then I got the brainstorm to use it as a guestbook and I'm so glad I did. It'll be nice to have for her when she's older. Innocent? Oh, that's not the page I signed. :) The book is so sweet all the way through!